Attractions like Sipoonkorven Kansallispuisto and Tuusulanjarvi (Lake Tuusula) make great kid-friendly stops. Step out of the city life by going to Nature & Wildlife Tours and Uutelan luontopolku. Explore Helsinki's surroundings by going to Sipoo (Savijarvi Gard Manor & Gumbostrand Konst & Form), Vantaa (VM Karting Center & Pyhan Laurin kirkko) and Jarvenpaa (Ainola - The Home of Aino and Jean Sibelius & Jarvenpaan Taidemuseo). Pack the 22nd (Wed) with family-friendly diversions at Linnanmaki Amusement Park. There's much more to do: test your team's savvy at popular escape rooms, take an in-depth tour of Seurasaari Island and Open-Air Museum, try out the rides at Adventure Park Zippy, and browse the exhibits of Sea Fortress Suomenlinna. To find where to stay, maps, and other tourist information, use the Helsinki holiday site . Melbourne, Australia to Helsinki is an approximately 22.5-hour flight. You can also do a combination of train and flight. The time zone difference moving from Australian Eastern Standard Time (Victoria) to Eastern European Time is minus 8 hours. Expect cooler weather when traveling from Melbourne in April: highs in Helsinki hover around 9°C, while lows dip to 0°C. Cap off your sightseeing on the 17th (Sun) early enough to go by car to Espoo. Espoo is the second largest city and municipality in Finland. 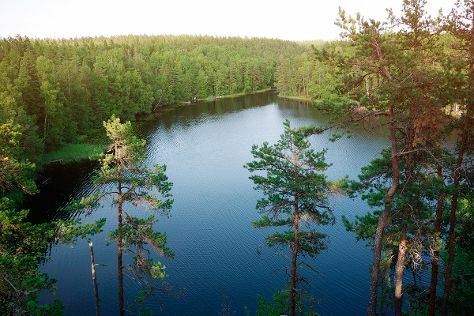 On the 18th (Mon), explore the wealth of natural beauty at Nuuksio National Park. Get ready for a full day of sightseeing on the 19th (Tue): identify plant and animal life at Laajalahti Nature Reserve, head outdoors with Arctic Expedition, and then take in the spiritual surroundings of Espoo Cathedral. For traveler tips, more things to do, and tourist information, use the Espoo day trip planning tool . Espoo is just a short distance from Helsinki. In May, daily temperatures in Espoo can reach 19°C, while at night they dip to 6°C. Wrap up your sightseeing on the 19th (Tue) early enough to travel to Loviisa. Loviisa is a municipality and town of inhabitants on the southern coast of Finland. Get in touch with nature at Hiidenvuori and Santalahti Nature Trail. Kids will enjoy Arboretum Mustila and Beach Mansikkalahti. Change things up with these side-trips from Loviisa: Kotka (Sapokka Water Garden, Linden Esplanade, & more), Valkmusa National Park (in Siltakyla) and Porvoo (Porvoo Old Town, The Runeberg Home, & more). The adventure continues: explore the striking landscape at Hiidenkirnut, pause for some serene contemplation at Loviisan kirkko, take an in-depth tour of Bunker Museum, and contemplate the long history of Main Building of Military School. To see other places to visit, maps, where to stay, and more tourist information, you can read our Loviisa trip itinerary site . You can drive from Espoo to Loviisa in 1.5 hours. In May in Loviisa, expect temperatures between 18°C during the day and 6°C at night. On the 2nd (Tue), wrap the sightseeing up by early afternoon so you can travel back home.